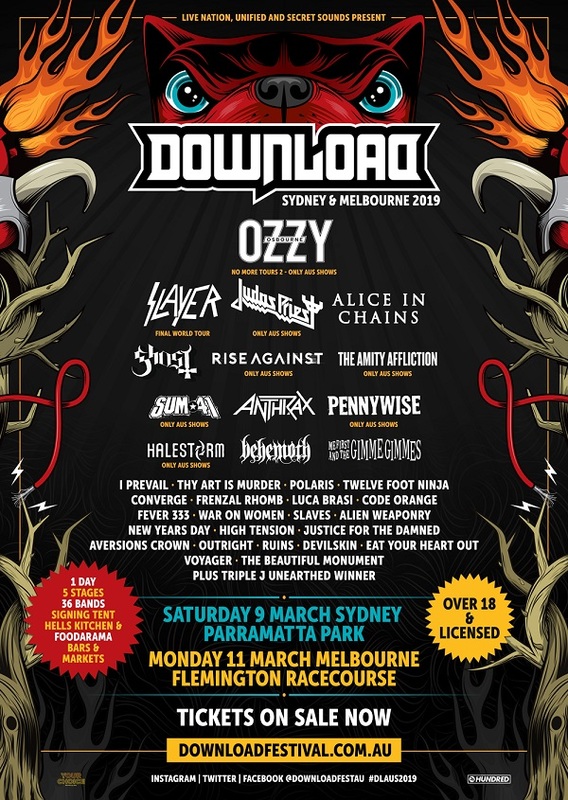 In true Aussie spirit we are taking the best of New Zealand and claiming them as our own… with that in mind, we are excited to announce the Ascension Stage for Download 2019! 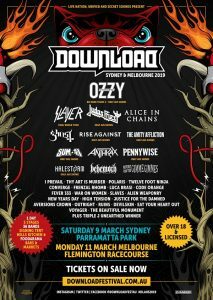 A new stage showcasing those blistering acts that are on the rise to be the headliners of tomorrow…. Please welcome…. Western Sydney’s heavy hitting Justice For The Damned came out of the gates swinging with their Greyscale Records debut “Dragged Through The Dirt”. The band have proven they understand the concept of hard work with tour after tour after tour; first doing their own headlining run, before supporting Thy Art Is Murder around both Australia and then straight to a thirty date run through Europe before returning home to support shows with In Hearts Wake, Miss May I, and Parkway Drive, before rounding things out with Polaris on their sold out Dusk To Day tour. Australian metal slayers Aversions Crown are like a cataclysmic storm making landfall, with a modus operandi to destroy everything in their path! With a slew of festivals and here and overseas in their wake, the Brisbane outfit have refined and sharpened their already potent mix of brutal death metal speed and violence with eldritch atmospherics, audio manipulation and vocalist Mark Poida’s otherworldly vocal range and ability into a new level of destruction. Devilskin are a phenomenon in their native New Zealand, their Platinum selling debut album We Rise entered the NZ national album charts at Number 1 and stayed in the top 40 for over 54 weeks! Devilskin have earned a formidable reputation by earnestly demonstrating commitment to unpretentious musical values, writing songs that have depth and passion, and a relentless touring schedule. Their tactical instrumental attack is balanced by the seductive Jennie Skulander and her incredible voice that sweeps from whisper to roar, rips with power, drips with melody and captivates with sincerity. Novocastrian outfit Eat Your Heart Out carry on the tradition of Australia’s impressive history of musical outliers from Nick Cave and Silverchair to The Amity Affliction and Parkway Drive, but they do so unequivocally on their own terms. The group’s grunge-y pastiche of emo energy, punk power, and pop palatability immediately ignited excitement around the world upon their emergence in 2012. Their lyrical honesty ensures that the message resonates loudly in the end. Melbourne-based, The Beautiful Monument are a locally brewed force to be reckoned with. The group inject listeners with instantly relatable lyricism that levitates around themes of psychological strains, the pains and perils of broken relationships and the incessant impact of various forms of abuse. Embraced by fans and critics alike for their engaging live shows and genre diverse song writing. The girls have no intention of slowing down, kicking off the year in a big way at Download before the highly anticipated release of their sophomore album.